MUSICIANS. Yani Gale Valendez, Grant Eythan Lim, Al Gabrielle Valendez, Sean Benedict Hong, Cecile Angela Abellana, Louie Gexelle Bugtai, Marielle Beverly Bugtai, professor Reynaldo Abellana and Geraldine Abellana. Not in the picture is Bruce Albert Lim, who flew to Vienna from Memphis, Tennessee because he won a music scholarship there two years ago. BEFORE THE CONCERT. At Danube Hall, Budapest, Hungary (from left): Sean Benedict Hong, Louie Gexelle Bugtai, Bruce Albert Lim, Yani Gale Valendez, Mariella Beverly Bugtai, Al Gabrielle Valendez, Cecile Angela Abellana, Geraldine Abellana, Grant Eythan Lim and Reynaldo Abellana. 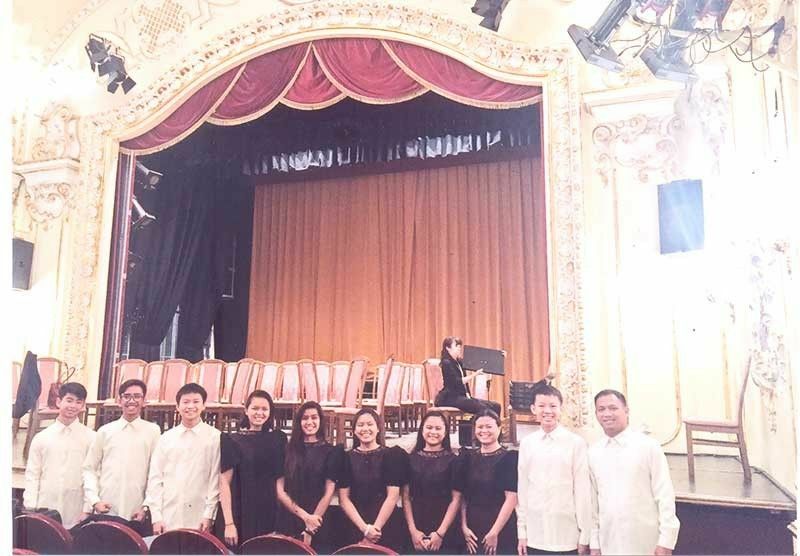 TEN members of Cebu’s Classic Youth Orchestra (CYO) left last March 27 to play with the World Youth Friendship Orchestra (WYFO) in Austria last March 30 and in Hungary on April 2. 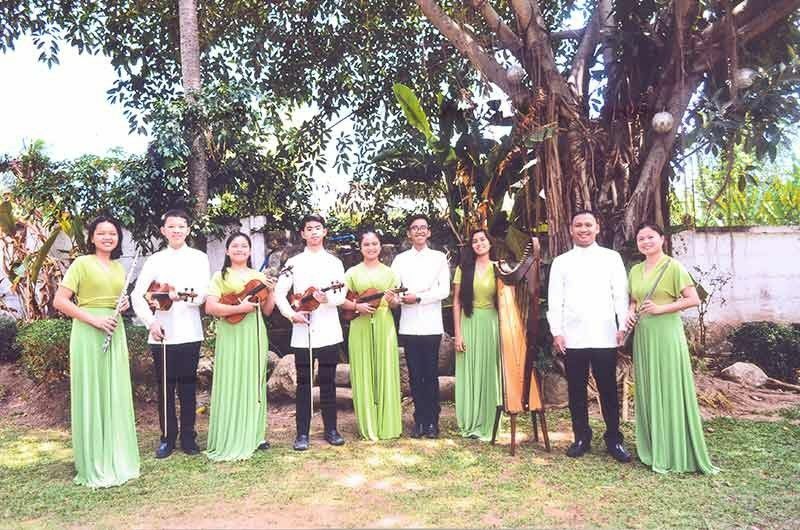 The group is composed of Bruce Albert Lim, Al Gabrielle Valendez, Cecile Angela Abellana and Sean Benedict Hong, for violin; Grant Eythan Lim for viola; Marielle Beverly Bugtai for harp and piano; Louie Gexelle Bugtai for percussion; Yani Gale Valendez and Geraldine Abellana for flute; and CYO director Reynaldo Abellana who plays both violin and viola. The World Youth Friendship Orchestra is represented by 15 countries, and this is the first time that musicians from the Philippines joined the group. The WYFO played in Weiner Musikverein (Golden Hall) in Vienna, Austria and in the Danube Palace in Budapest, Hungary to sold-out audiences. Asked how they were able to join WYFO, Reynaldo explained that he always sends videos of CYO concerts to the festival organizers who are always looking for youth orchestras from every country to join the festival. The videos served as the group’s audition to qualify for joining the WYFO, with professor Shinichi Minami of Japan giving the group the go-signal. For this festival, the Philippine delegation was the only orchestra which did not have a sponsor/benefactor to help defray the cost of transportation and accommodation. But for Reynaldo, the expense was worth the young musicians’ exposure to a different audience, different “music mates” and different conductors, especially for those among them who might choose to become professional musicians in their chosen instruments. The students now know that they can play their instruments anywhere in the world under any conductor. As part of the musical growth of CYO, Reynaldo added that the whole group this time, will be off to Vancouver, Canada in April 2020. The group will have pianist Ingrid Sala-Santamaria as its soloist during the tour.